Get ready to rock with "KK at Pyaar Ke Pal" In his Live-In-Concert, the biggest and most awaited musical evening of the city. KK has touched many hearts, stimulated many minds, changed many lives and inspired many souls, all through the raw power of his voice. Krishnakumar Kunnath (Popularly known as KK) is an Indian playback singer. He is a prominent singer in Hindi, Tamil, and Telugu films. His first song for a Bollywood film was Chhod Aaye Hum (Maachis). But it was the song Tadap Tadap, from the movie Hum Dil De Chuke Sanam, that brought him into limelight. His most popular songs are: Tu Aashiqui Hai, Chand Ki Roshni Se, Awarapan Banjarapan, It's The Time To Disco, Dus Bahaane, Tu Hi Meri Shab Hai, 'O meri Jaan, Soniye Soniye, Mera Pehla Pehla Pyaar Hai, Alvida Alvida, Ajab Si, Kya Mujhe Pyaar Hai and Khuda jaane ke. 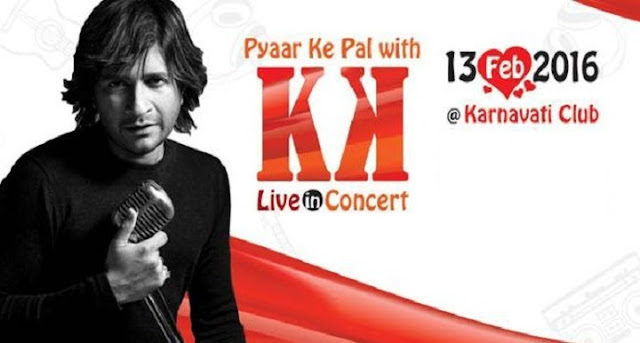 Come along with your valentine, and fall in love with KK's music all over again and witness the musical extravaganza by the most versatile singer of the industry and Enjoy Pyaar Ke Pal with KK..............!! !